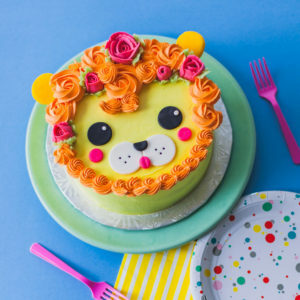 Last week, cake artist Lyndsay Sung from Coco Cake Land took over our Instagram to show us how to make this adorable buttercream lion cake. Perfect for any birthday celebration, this sweet treat is both fun and easy to achieve. We’re here to recap Lyndsey’s Instagram tutorial to show you how! All cute cakes start with a sketch. Follow Lyndsay’s drawing above or create your own to plot out what your cake should look like. Think about decoration colors, placement and size as you get started. Coat your cake with a cheerful yellow buttercream frosting. Once it’s iced to your liking, set it aside. Use the smooth, wide end of piping tips or circle cookie cutters to punch out pre-colored fondant. Lyndsay suggests rolling out the fondant to 1/8 inch thickness for the lion face pieces. 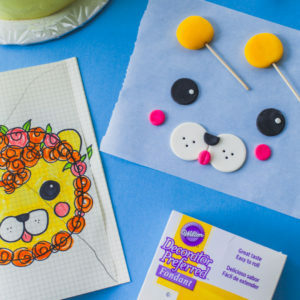 Flatten two 1-inch balls of yellow fondant and pierce each with a wooden skewer to create little lion ears. Lightly place the fondant pieces onto the top of the cake. Gently press the fondant pieces into the buttercream icing to help them stick. Fill a piping bag with orange-colored buttercream and fit with a classic 1M tip. Pipe rosettes along the top of the cake by squeezing the piping bag and rotating in a tight counterclockwise circle. Vary the sizes of your rosettes by using piping tips with different dimensions. Lyndsay adds additional whimsical flair by hiding little pink buttercream roses within the lion’s mane. Check out our guide to making buttercream flowers for a little extra help. We encourage you to be playful in your decorating, because who doesn’t love a lion with a flower tucked behind his ear? We hope you enjoyed Lyndsay’s lovely lion cake and can’t wait to see yours! Be sure to tag us at @wiltoncakes so we can see your creations. 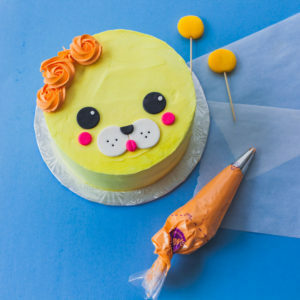 Visit Coco Cake Land for more kawaii cakes and our birthday page for delicious birthday inspiration!